Star Wars: The Force Awakens is still dominating at the box office, but some other Star Wars projects had some amazing success this year as well. 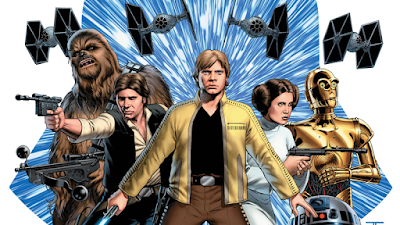 Four different Star Wars comic books, published by Marvel Comics, were among the top ten best selling comics of 2015. Marvel's Star Wars #1 was the top selling book (which is no surprise considering it's the first comic since 1993 to sell one million copies), with Star Wars: Vader Down #1 coming in at sixth place, Star Wars: Darth Vader #1 coming in at seventh place, and Star Wars: Princess Leia #1 coming in tenth place. Congrats to the team at Marvel for all their success with the Star Wars comics this year, and especially to Jason Aaron and John Cassaday (writer and artist for Star Wars #1) for creating the best selling comic book of 2015!